Pounded Yam is one of the Nigerian fufu recipes that is eaten with the various Nigerian soup recipes. The most popular combinations are Pounded Yam with Egusi Soup, Pounded Yam with Nsala or White Soup and many more. Pounded Yam is the most stretchy of all the Nigerian fufu recipes that is if it is well prepared. It has the softness of semolina fufu hence it is not as hard as cassava fufu. Pounded Yam can be prepared by stirring yam flour in hot water but those who have eaten the one made from scratch with raw yams will tell you that the yam powder method does not do the pounded yam good justice. To prepare pounded yam from scratch, you simply cook white yam and pound the yam pieces with a mortar and pestle when done. Sounds easy, doesn't it? Not really. 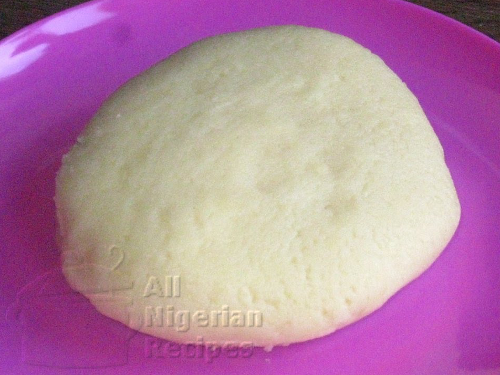 But you can make pounded yam in a blender, click here or with a stand mixer, click here. There are a few tricks to making the perfect stretchy Pounded Yam with a mortar and pestle and it is better to see these than try to understand the written explanation. Watch the video below to learn how to make the perfect stretchy pounded yam so that your days of making mashed potatoes in the name of pounded yam will stop right here.